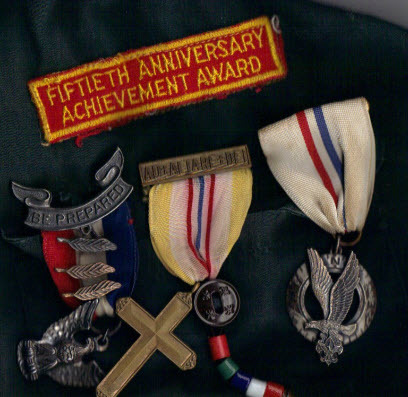 Opportunity, Perseverance, Service - (also known as OPS) The organization started in the 1930's or 1940's at Camp Spaulding and continued on at Camp Tuscarora, Summit, NY. Membership was signified by three beads (red, white, and blue) There were an additional green bead for a level similar to OA Brotherhood and a bigger red bead for a level like OA Vigil Honor. The beads were worn on the left breast pocket on a small leather or gimp loop fixed by the button. 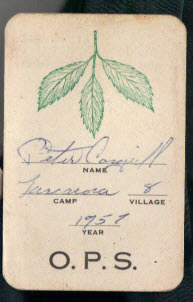 Membership was based on Camp Staff recommendations. The ritual was similar to OA with Indian costumes for those doing the ceremonies. There was a service project performed in silence and a talking stick worn around the neck on a string. The program died out in 1960 when a decision was made to only allow OA at the camp. Kind thanks to Peter J. Cosgriff for the images and for this information.